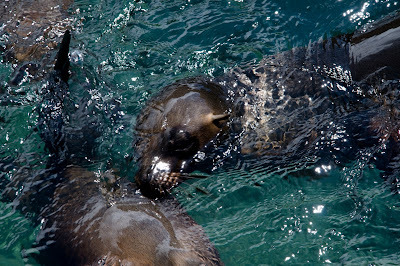 Because of the location of the Galapagos Islands, the dive conditions include strong and cold currents. Therefore Galapagos diving aboard a specialized dive yacht or cruises with occasional diving is only recommendable for intermediate or advanced divers with experience in cold water and with drift and/or wall diving. Divers with 5 to 30 dives logged are considered beginners divers. Divers with 30 to 100 dives logger are considered intermediate divers. Divers with more than 100 dives logged are considered as advanced divers. The dive limit is 30 meters or 100 feet and no one can dive alone. Dives depend on the sea conditions (currents, wind, visibility, temperature, surge and other variables). Currents are unpredictable and may be negligible or up to 3 knots. In Pto. Ayora on Santa Cruz Island you find the Galapagos Hyperbaric Chamber and in town it is also possible to buy DAN diving insurance. But if you take a cruise with occasional diving or a specialized dive cruise you need to sort out your insurance before travelling to the Galapagos, because you are not able to arrange insurance in Galapagos.